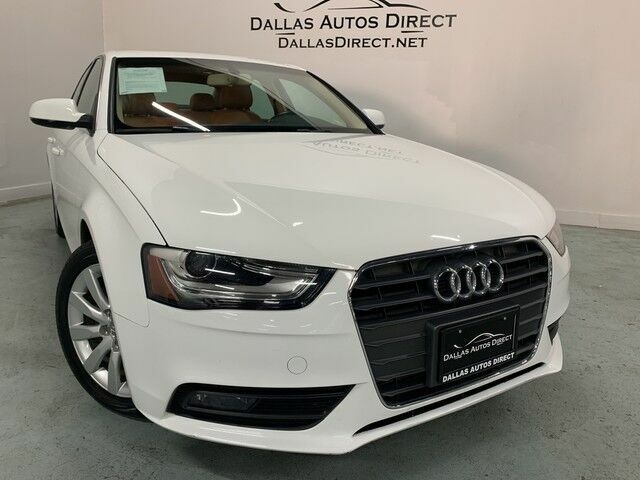 This 2013 Audi A4 Premium is offered to you for sale by Dallas Autos Direct. This 2013 Audi A4 comes with a CARFAX Buyback Guarantee, which means you can buy with certainty. This 2013 Audi A4 has great acceleration and wonderful styling without sacrificing exceptional fuel economy. Exceptional in every sense of the word, this incredibly low mileage vehicle is one of a kind. More information about the 2013 Audi A4: The Audi A4 competes with top sport sedans from Germany, Japan, and the U.S., including the BMW 3-Series, Mercedes-Benz C-Class, Cadillac ATS and INFINITI G37, as well as the Acura TL. Among these models, the A4 offers one of the best compromises between comfort and performance, as well as exterior and interior designs that are superbly coordinated. With its 2.0T engine, the A4 is also one of the most fuel-efficient models in its class, while the S4 offers one of the highest power outputs, excluding track-focused models. In-dash technology, connectivity and infotainment is also a strength of the A4 and S4 family. While Audi Connect made its debut in Audi's larger models, the A4 gets the most advanced new form of the system, with Google Maps data and one of the clearest mapping displays. Strengths of this model include sporty, stylish interior, advanced infotainment and navigation systems, Handsome exterior styling, excellent quattro all-wheel-drive system, and powerful yet fuel-efficient powertrains Finance available with applicable fees.